Tumbled stone is commonly used in exterior applications because the textured surface is safer to walk on when it’s wet. However, this finish is moving into homes and businesses around the nation because people love the look and rough finish. It’s a particularly appealing choice when finishing off a kitchen backsplash. While you may not like the idea of simple straight rows moving across the backsplash, you don’t have to settle for anything simple. There are several patterns you can choose to make the backsplash more appealing and an attractive focal point of the kitchen. Most people take tiles and line them up like neat rows of bricks, but this look may be too simple for your tastes. A better option is to set them on point to create a harlequin design. One common complaint of working tiles on point is that there’s more waste. While this is true, the difference in the finished look is well worth the minor increase in materials. You can also minimize waste by keeping your scraps organized to use leftover tiles in other areas of the project. It takes a little more work to look through scraps for a piece that will fit perfectly, but you’ll save on materials and may even reduce the wear on your saws. Another possibility to consider is combining the use of squares and diamonds for sharp geometric combinations. Run a simple border of square tiles directly along the counter, then top it with the harlequin pattern. Use the basic square, brick-like pattern in smaller areas between cabinets and counter. When you reach the section behind the stove, bring more attention to this open space by putting the tiles on point. Changing the direction of the tiles will also make this area feel taller and more impressive. You can also use a diamond pattern that’s completely bordered by your square tiles. Even if the tiles are all the same color, simply changing the pattern in this manner will make the entire backsplash look more elegant. If you’re willing to work with tiles of different sizes, then you can create truly impressive patterns. Use a mosaic border along the upper edge of your backsplash for visual interest. Put a row of smaller tiles along the counter to mimic a raised area and make the counter seem longer. Strategically place smaller tiles in between the larger ones to add color, texture and different shapes. You can even cut openings inside larger tumbled tiles and then set polished stones inside for a pattern that is sure to be eye-pleasing. When you’re considering creating tile pattern using different sizes, take the time to draw it out on paper. Not only will this help you when it’s time to order materials, but you’ll also be able to see how appealing the finished look is. You can mix almost anything with your tumbled tiles. Borders with elegant patterns pressed into them are a top choice, or you can use highly polished stones to develop an incredible focal point. There are special painted tiles available that form an elegant picture when assembled properly, and tumbled tiles make an excellent framework for these artistic images. Consider adding a beautiful plaque in any key area of the kitchen for visual appeal and timeless interest. Whether you’re drawn to reflective glass mosaic tiles or love colorful ceramic patterns, you can mix anything with tumbled tiles. The combination of different textures and colors will add interest to your backsplash and ensure that it becomes an integral part of the kitchen. If you choose tiles that make a picture, consider framing in the artwork. You don’t have to surround the beautiful scene with border tiles that sit flush with the tumbled tiles. Choose special raised border tiles that will make it look like a piece of elegant framed art. The tiles are just as easy to clean because they’re made from porcelain or natural stones. Many contractors stick with monochromatic themes in the backsplash. This is a safe move because you don’t want the space to feel overwhelming or gaudy. However, that doesn’t mean you have to avoid color and contrasting shades when creating your custom designs. Adding a short row of jet black tiles directly over the sink or stove draws attention to that area while still maintaining a classy feeling. A narrow strip of darkly colored tiles that marches the length of the counter will make the entire kitchen feel larger and help tie in the other kitchen colors. You can also use gently contrasting colors to make different shapes and designs stand out a little more without demanding too much attention. When you purchase subway tiles, it’s expected that their rectangular shape will be set with the long edge in a horizontal position. However, you can make the backsplash look taller by turning the tiles on their sides. The eye naturally follows the lines of the tiles, and putting the long edge in the vertical position will draw the eye up rather than across the counter. If your counters are already very long and are dominating the room, then you can provide balance and beauty by doing something unexpected with the tiles. How fancy you make the pattern depends largely on your target clientele. Designers can go with more aggressive patterns and color combinations because their clients will have an opportunity to make changes or suggestions. These clients aren’t typically looking for anything too plain, so they’ll appreciate being offered the elegant patterns that will make their kitchen stand out more. However, you may want to go with more simple designs if you’re building homes for sale or working on a commercial project. The beauty of simple patterns is that they appeal to a wide range of clients. People like tile backsplashes because they’re easy to clean and more impressive than sheet rock. They show that you pay close attention to detail and care about quality. They help you make a great first impression on all types of customers and homebuyers. If you’re working on a project that must appeal to a wide range of personalities, then you’re better off going with simple patterns and finishes. One option you may not have considered is the partial finish. You don’t have to carry the tiles all the way up to the lower edge of the cabinets, and that may seem like too much if you have extra space between counters and the other fixtures. You may decide that just one or two rows of tiles look incredible and add visual appeal. If you go with this type of finish, be sure to silicone the top edge of tiles to keep water out and make them easier to clean. When you’re working on a large project, you need a supplier that offers wholesale pricing. Nalboor can help you save money with our competitive rates, and you’ll appreciate our quick responses. All of our tiles are professionally manufactured for a consistent finish and quality. 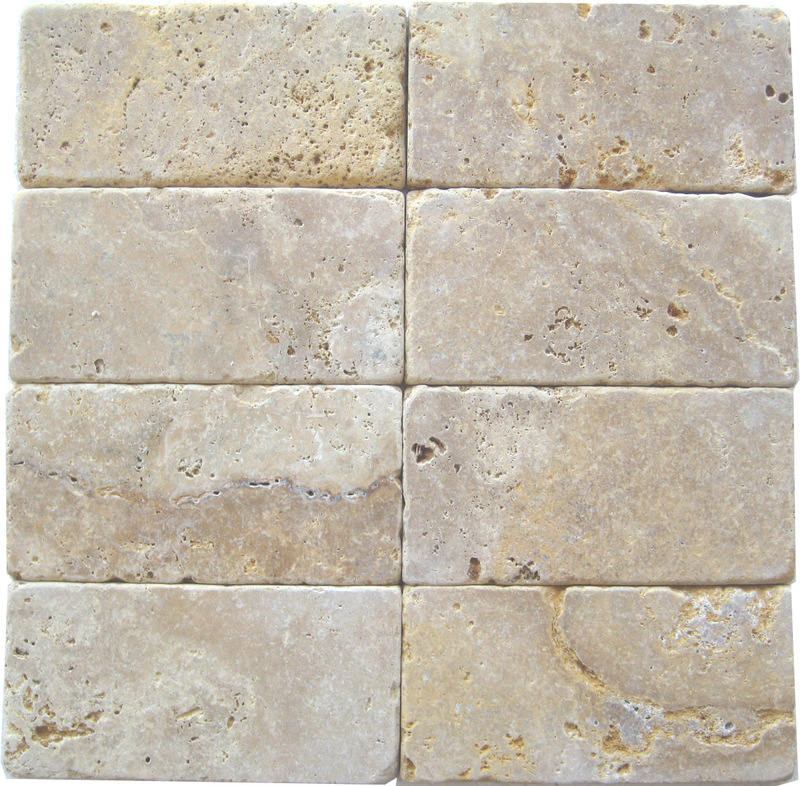 We carry tumbled stones in four-inch squares and three-by-six-inch subway tiles. Our color options range from light tan to deep rose, so you can get the contrasting or coordinating colors that will work best with your new custom pattern. We’re looking forward to helping you with all of your tile needs, so contact us today to speak with our customer service professionals.